Inaccurate assumptions about older adults may result in depression being underdiagnosed and undertreated in this population. All too often, people make stigmatizing assumptions about older adults and depression. For example, one may suggest that an older person could be depressed because they have outlived their friends and family. Or perhaps an older adult is depressed because they are no longer able to live independently. While there may be experiences such as these and others that occur across one's lifespan resulting in grief, sadness, and loss, it is important for social workers to understand that depression is not a normal part of aging. According to the National Alliance on Mental Illness, more than 6.5 million Americans age 65 and older are living with depression. Despite its prevalence, depression in older adults often goes untreated because it is commonly associated with being normal for this age group (National Alliance on Mental Illness, 2009). In addition to debunking myths and developing a deeper understanding for experiences that occur during the lifespan, it is important to learn the differences that may exist when identifying depression in older adults. Changes in physical health can be significantly correlated to the onset of depression of older adults (National Alliance on Mental Illness). However, lack of socialization, a reduced sense of purpose, death and loss, and fear are also found to be significant variables (Robinson, Smith, & Segal, 2017). While these experiences occur at different points across the lifespan, expectations for coping with these experiences are imposed on older adults because of society's contribution toward ageism. Because individuals are old and perhaps closer to the end of their life in comparison with the rest of the population, they are expected to cope better with these significant life experiences. Another expectation in need of debunking in relation to depression and aging are the differences in presentation. For example, the main symptom of depression is often seen as sadness (National Institute of Mental Health, 2017). However, older adults may also have physical health symptoms, changes in memory or alertness, irritability, delusions, and hallucinations (National Institute of Mental Health; National Alliance on Mental Illness). What can cause even more complication, in relation to identifying depression in older adults and people of any age, is stigma, which has consistently been identified as a barrier to seeking help. While there have been many efforts to reduce mental health stigma in order to encourage individuals to access support, older adults have been found to connect with mental health treatment at a rate lower than any other adult age group (Bartels, Blow, Brockmann, & Van Citters, 2005). This could be a result of generational differences but also an impact of societal expectation. It is hopefully common knowledge by now that the aging population is experiencing exponential growth. According to a research report by He, Goodkind, and Kowal of the U.S. Census Bureau (2016), the number of Americans aged 65 and older will grow from 48 million to 88 million by 2050. Because of this increase, it is likely that social workers will be supporting an older person's needs whether they are directly working with them or not. Along with the increase in the aging population, there has also been an increase in informal or familial caregivers. The average caregiver is a female around the age of 49 (National Alliance for Caregiving & AARP, 2009). Social workers and other members of the helping profession are responsible for providing support to an individual in all aspects of their life; for many, adapting to the caregiving role may be a part of a client's needs. In addition to being aware of the impending growth of this population, it is important to understand that not all elders are the same, just as everyone who is young is not the same. In working with any population, it is vital to acknowledge and respect the differences among individuals or clients, and their experiences. A 65-year-old client may have different life goals and experiences vs. an 85-year-old client, just as a 21-year-old client may be different from a 41-year-old client. To further demonstrate the diversity of the aging population, researchers have developed a type of identification method that may help to provide an understanding of the differences among older adults. According to the U.S. Census Bureau (2011), there are three subpopulations within the larger aging population. The young are those between the ages of 65 and 74, the old are between the ages of 75 and 84, and the oldest are ages 85 and onward. This categorization allows for practitioners to better frame their approach within an age-appropriate context. As America's life expectancy continues to rise, it is especially necessary to understand the heterogeneity that exists. Despite the growth of the aging population, there is still a lack of helping professions such as geriatric social workers and geriatric physicians. According to NASW (Pace, 2014), 70,000 geriatric social workers are needed to help meet the needs of the aging population. It is significantly important not only for more professions to enter the field of aging but also for an increased understanding of what mental health looks like through an aging lens. As we age, we become vulnerable to an array of different experiences that can impact our mental health. These impacts may be a result of physical, social, or emotional conflict that occurs throughout the lifespan. Most often, older adults in America are experiencing memory changes and mood disorders such as depression and anxiety (American Association for Geriatric Psychiatry, 2008). According to the World Health Organization, more than 20% of adults aged 60 and over are living with a mental or neurological disorder. With the growth of the aging population, the prevalence of mental health may continue to rise for the aging population and thus the country as a whole. Despite this, the mental health needs of older adults may not receive quality support due to the way society downplays the experiences of older adults as something to be expected. In building a foundation for understanding, older adults and mental health social workers should become aware of how experiences that often occur as we age are nonetheless impactful, life changing, and deserving of quality care. Largely, this begins with debunking societal myths and stereotypes of older adults and reframing these experiences with respect to their potential impacts. Physical health can influence emotional health. They are undeniably connected. People with mental health conditions are more likely to have co-occurring physical health challenges (Center for Behavioral Health Statistics and Quality, 2012). Developing chronic illness and changes within strength, ability, and mobility are physical changes that individuals who are aging can experience and thus be psychologically and emotionally impacted by. Although it may not seem as critical as chronic illness, falls can be extremely dangerous to an older adult's physical, emotional, and psychological health. Every 19 minutes, an older adult dies from a fall (National Council on Aging, 2017). Fall prevention is a significant, evidence-based initiative provided by a variety of different professionals in the aging field. The National Council on Aging has approved approximately 10 programs that have demonstrated, through experimental design, the benefits of fall prevention programs. Programs such as these have the power to restore physical strength. But despite these programs, falls are still common, with an average of one in four Americans aged 65 and older experiencing a fall each year (National Council on Aging). Often, the result can be life changing and even fatal. Individuals may demonstrate significant changes in their lifestyles as a result of a fall or the fear of falling. One may become withdrawn due to the fear of falling or perhaps because they can no longer access what they once were able to prior to the fall. It may be difficult to surmise what exactly someone may be feeling after experiencing a fall; however, it has been researched that, in addition to leading to physical decline, falls may also result in depression and social isolation (National Council on Aging). Falls and fear of falls can significantly impact an individual's sense of self and quality of life. When one feels broken, they may perceive their surroundings to be broken. They may feel shame or embarrassment for falling or being afraid of falling. A fall demands a person to process the practical change as well as cope with the emotional impact of this new norm. It can serve as a catalyst for dependency. Often, little time or attention is paid toward emotionally processing such an event in life because society may assume it to be a natural process of aging. While one's risk of falling can increase with age, it is neither a normal part of aging nor something easy to experience. Change is inevitable across the lifespan. The relationships we have with ourselves and other objects are dynamic and constant. At any time in life, we can expect to experience the beginning and ending of different relationships. We can, in most cases, expect to begin life with parents and end life without them. We can expect to start romantic relationships, have them last, or have them end. We can begin new jobs and leave them. While these expectations are sensible to an obvious degree, they can also be stereotypical and limiting for working to support older adults. For example, we can surmise for a younger person whose spouse passed away that there would be a surge of support available. Generally we can expect family, friends, and even professionals to show their support differently to a younger widow vs. an older widow. For older persons who may have outlived their spouse, individuals can perhaps excuse this death because the individual may have been older and it is to be expected; after all, aging and death are wrongfully yet commonly associated with each other (Gutman, 2015). This expectation may then adversely influence the type of support being offered to the older widow. Outliving a spouse, family member, or friend can be painful and depressing no matter what age you are, no matter how it happens. Although we are all hardwired to know that our parents, generally, will pass on before us, it is still nonetheless difficult to mourn the loss and grieve their death, despite perhaps expecting your parents to pass away as a primitively natural part of life. No matter how much we can prepare for loss, whether it be death, retirement, or change in independence, it still has the power to produce grief. Losing someone or something, no matter what age, can cause grief, guilt, and sadness. While there is no single guide for grief, it is important to recognize that prolonged grief can lead to depression. Dementia and depression can often be intertwined and mistaken for one another as an individual living with dementia may experience depression, and a person living with depression may begin to demonstrate memory loss (Robinson, Smith, & Segal). While the relationship between dementia and depression may be complex, it is important for professionals to recognize that they are different diagnoses, and consultation with a physician at this point of care is crucial. As treatment for depression can be significantly effective once diagnosed, it is especially important to explore what may be the cause of observed changes (National Alliance on Mental Illness). While there may be many reasons why someone could become depressed beyond the scope of this text, it is important to recognize that depression is not unique to younger individuals. As social workers and helpers, we are charged with helping individuals navigate through challenges that life may bring across the lifespan. Being "over the hill" is an anecdotal sentiment that implies that, after a certain age, life will all be downhill from here. The dialogue in this text is intended to help develop empathetic understanding of potential experiences that occur as we age in order to educate on the presence of depression in the aging population. It is also intended to denounce any idea that depression is normal for an aging person, or for any person for that matter. According to the American Foundation for Suicide Prevention (2015), older adults aged 85 and older account for the second highest rate of suicides in the United States. An increase in education, research, and resources are necessary now more than ever, especially as the aging population continues to grow. — Lauren Snedeker, LMSW, is a licensed social worker with the Alzheimer's Foundation of America. American Foundation for Suicide Prevention. (2015). Suicide statistics. Retrieved from https://afsp.org/about-suicide/suicide-statistics/. Center for Behavioral Health Statistics and Quality. (2012, April 5). The NSDUH report: Physical health conditions among adults with mental illness. Retrieved from http://archive.samhsa.gov/data/2k12/NSDUH103/SR103AdultsAMI2012.pdf. Gutman, A. (2015, March 17). Aging is not death: Stop conflating the two. The Washington Post. Retrieved from https://www.washingtonpost.com/posteverything/wp/2015/03/17/aging-is-not-death-stop-confusing-the-two-2/?utm_term=.5fe3da3ca737. He, W., Goodkind, D., & Kowal, P. (2016). An aging world: 2015. Retrieved from https://www.census.gov/content/dam/Census/library/publications/2016/demo/p95-16-1.pdf. National Alliance for Caregiving, & AARP. (2009). Caregiving in the U.S. Retrieved from http://www.caregiving.org/data/Caregiving_in_the_US_2009_full_report.pdf. National Alliance on Mental Illness. (2009). Depression in older persons fact sheet. Retrieved from https://www.ncoa.org/wp-content/uploads/Depression_Older_Persons_FactSheet_2009.pdf. National Council on Aging. (2017). Fall prevention facts. Retrieved from https://www.ncoa.org/news/resources-for-reporters/get-the-facts/falls-prevention-facts/. National Institute of Mental Health. (2017). Older adults and depression. Retrieved from https://www.nimh.nih.gov/health/publications/older-adults-and-depression/index.shtml. Pace, P. R. (2014). Need for geriatric social work grows. 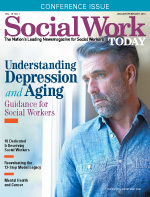 Retrieved from http://www.socialworkblog.org/nasw-news-article/2014/02/need-for-geriatric-social-work-grows/. Robinson, L., Smith, M., & Segal, J. (2017). Depression in older adults: Recognizing the signs of elderly depression and getting treatment. Retrieved from https://www.helpguide.org/articles/depression/depression-in-older-adults.htm?pdf=true. United States Census Bureau. (2011). Sixty-five plus in the United States. U.S. Census Bureau, Population Division.